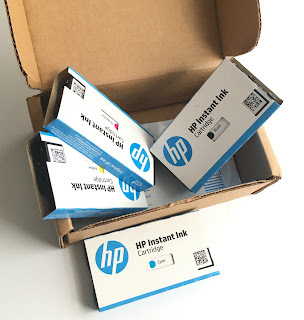 Ok teacher friends, have you heard about the HP Instant Ink program?? 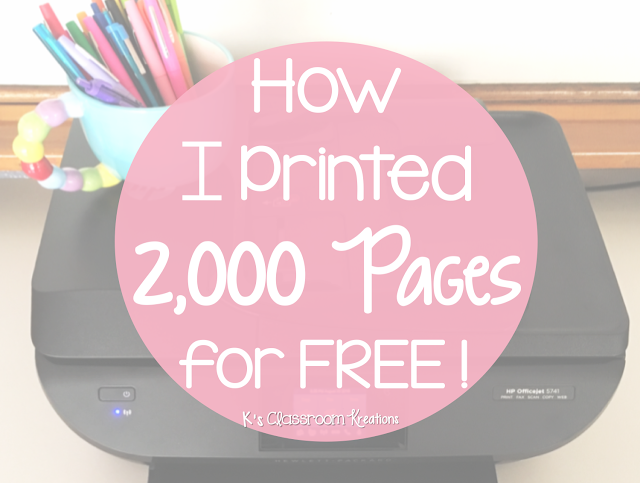 Today I'll share with you how I was able to print over 2,000 pages (in color!!) for free and how you can earn free pages too. I will also answer some of the most commonly asked questions I have heard from teachers about the program. Please note, this post does contain affiliate links which means that I earn a small amount when you make purchases or enroll. However, my promise to you is that I am only sharing my honest opinions and I will never promote something I do not believe in. See my disclaimer page for full details. I'll be honest, I was a skeptic when I first heard about the Instant Ink program. I even had my printer for almost a year before I decided to take the plunge. Living on a teacher's budget makes me watch my spending pretty carefully, but I have to say, this was so worth it! I define Instant Ink as one of the best decisions I've made lately...and a huge sanity saver! But, I suppose a more technical definition may be needed as well. Instant Ink is a monthly subscription program through HP that monitors your ink usage wirelessly. Then, they send you new ink as soon as you start to get low. You pay by the amount of pages that you print, not by the amount of ink you use. This means that you can literally print everything in full color if you need to! What kind of printer do you need? First, you need to see if your HP printer is compatible with the Instant Ink Program. The printers listed below are compatible. 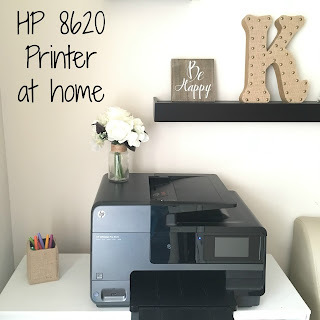 I currently have the HP OfficeJet Pro 8620 which I love! Sadly it has been discontinued but they do have a newer model which is the HP OfficeJet Pro 8720 . 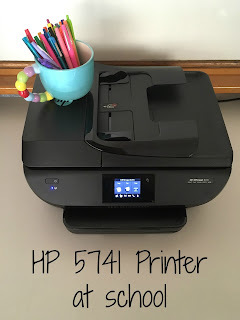 I also just bought the HP OfficeJet 5741 Printer this summer because it came with one year of instant ink! If your printer is not compatible now is a great time to find one with all of the back to school sales. 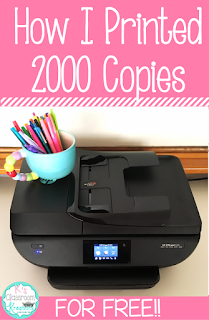 If your printer is compatible, you are in luck because it is super simple to sign up and I will walk you through the basics. When you enroll in the program you can choose a plan that works best for you. The plans start at just a few dollars a month and the most expensive plan is currently only $9.99 a month. I have the $9.99 plan which means that I can print 300 pages (in color if I choose) each month. Some months I have gone over my limit. In those situations I was charged $1 for every 25 pages I printed. At first I was worried about the cost but then realized that $1 was a LOT less than if I took 25 pages to my local copy store to be printed in color. Also, when I first enrolled in the program I had 6 free months (I promise I will show you how to get free months too) so I can justify a few dollars in overages. Now to the "Is it worth it?" part of the question.... To me, the answer is yes. When I would go out and buy ink I would easily spend $60-$100 at a time depending on how many cartridges I had to replace. Now, it would take me 6 -10 months to spend that much on ink using the $10/month subscription! I like that I am not making large payments at one time. I even tried using refurbished ink cartridges in the past which were definitely less expensive but often gave me trouble. Now as soon as I run out I know that I have larger than normal cartridges waiting as a backup for me in my office which means that I need to replace them less often than before too. Why does this work so well for teachers? 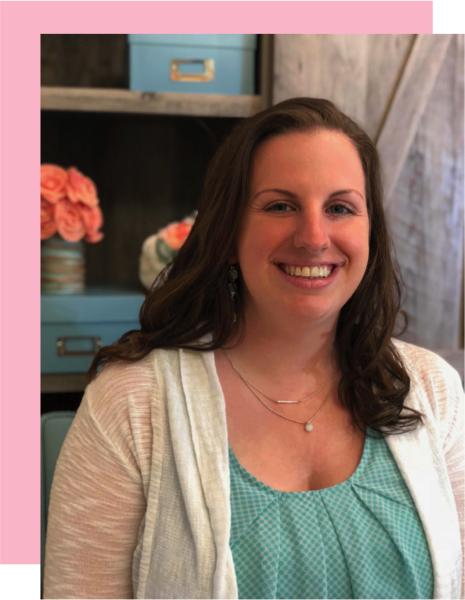 Here are a few of the reasons that I think this program works especially well for teachers. 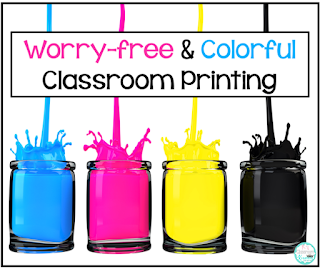 * Teachers love color!- It is so nice to know that I can print full color centers and materials without having to worry about running out of ink or needing to use the draft setting. My room looks beautiful and my students are happy. * Last minute binge printing is totally possible.... you never run out of ink! I don't know about all of you but I often occasionally put off school work until the night before I need something. Nothing is more annoying than happily binge printing when you suddenly run out of ink. Who wants to run to the store in PJs on a Sunday night?!? HP monitors your ink usage so as soon as they notice you are running low they send you more ink. *** Also, I want to mention that I was sent ink a few weeks ago and have since printed almost 400 pages and STILL do not need to switch cartridges yet. That is how far in advance it's sent. Plus, if you know you are going to be doing a ton of printing you can contact them (super friendly customer support) and they will rush you ink sooner. * It is cheaper than office supply stores. I already mentioned this once but again, I am saving so much money by not needing to buy ink all the time or take pages to copy centers. My teacher wallet is happy. * Change the plans as needed. Okay, just like we like to differentiate, so does HP. You can choose a plan that works for you and switch it whenever you need to at no extra cost! For example, if you know back to school requires a lot of printing then you can have the 300 page plan that month. However, maybe you are out of school for Winter break and want to switch to a lower plan in December. Totally fine! You can always switch back when you want to. * One less thing to think about. HP does the thinking for you. They will send you an email when your ink is getting low, and when you are getting close to your page limit for the month. They also mail the ink right to you. Simply drag your tired teacher body to the mailbox and you are good to go. 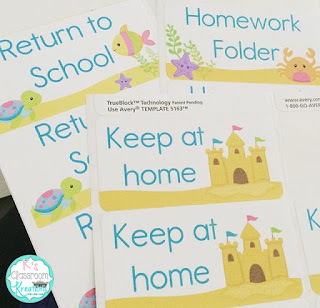 * Teachers love to share and earn free things! If you sign up for instant ink and love it like I think you will, you will probably want to tell all of your friends. Of course you can share this post with them but HP also has a referral program that makes it easy for you and your friends to earn a free month whenever they enroll using your code. Anything you want! It doesn't matter if you print a small picture, black and white worksheet, or full page photo. Each counts as one page. Also if you print something double sided know that it counts as two pages, just like the copy machines at school. HP monitors the pages printed, not the pieces of paper. I have printed everything from last minute homework assignments to colorful classroom decor. I use my HP 8620 the most since it is at home and have had no problems with it printing on different materials like card stock. 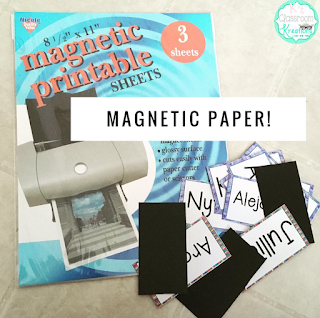 I have also printed on Avery Printable Magnet Sheets which are my new obsession. My printers take the magnetic pages great and it still counts as just a regular page. I also love using Avery 2 X 4 Shipping Labels to organize EVERYTHING in my classroom. What happens when I get to my limit each month? You can easily monitor how many pages you have printed through your HP account once you get set up. They will also email you when you are getting close to your monthly limit. If you do run out of pages you have a few options. 1) Use rollover pages- If you do not print all of your pages in one month the remaining pages will be stored as rollover pages (up to the total amount of your plan). This means that if you are on the 300 page plan you can have up to 300 rollover pages stored (maybe you save 50 pages one month, 100, the next, 20 a different month, etc.). If you need to go over your page limit one month and have rollover pages stored, your account automatically uses those rather than charging you. 2) Wait until next month- Not ideal, but you could wait until your monthly plan restarts. 3) Keep on printing and know that it is still less than an office supply store. This is typically what I do if I have have used all of my pages and my back up rollover pages. $3 in ink overages is better than the $30 it would have cost to buy a cartridge otherwise or the hassle of leaving my home to print somewhere else. Do I change the ink as soon as they mail it to me? Nope! They will send you ink far ahead of time and you just set it aside and keep using what you have. You only change the ink once your printer tells you you are completely out (mine usually stops printing unless I put new ink in at that time). Also they make it super easy for you to recycle your old empty cartridges for free. What happens when I first enroll? If you already have a printer and are ready to take the plunge you can click here to sign up. Again, it is a super simple process! Once you have signed up HP will send you a welcome letter and kit that contains ink. Your free trial or enrollment period does not begin until you actually install those cartridges. This means that you can use the ink you currently have in your printer until it runs out and then install the new ones. No need to waste ink. Teachers love great deals, I know I do. Here is how I think you can get the most bang for your buck. * First, when you enroll in the program you can enter Promo Codes to have a free trial. The trial is great because you will get a feel for the program without worrying about paying for it. You can also use the code 3MONTHS for three months free. Remember you can cancel any time but I do believe you will love it! * Enroll in the 300 page plan, especially if you are using the free trial. Print what you need to now, stock up on some rollover pages, and be able to print everything you need in color without worrying about going over your limit. *Save printing your black and white copies for school and enjoy loading up on color for your classroom using your Instant Ink. If I am printing simple worksheets or homework I prefer to use my school's copy machine. However, I have also printed plenty of last minute black and white copies at home (ex. sub plans) when I was in a pinch. Well if you stuck around for such a long post you deserve a pat on the back! I hope you were able to see the value in Instant Ink and are ready to join. If I can answer any other questions or help you get set up please just let me know, I would be happy to help. Want to save this post for later? Be sure to Pin the image below. 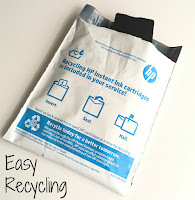 I LOVE my HP instant ink plan!! Do you know if there is a way to add promo codes even if you've been enrolled for a year already? I don't believe that you can (at least I haven't found a way to do it). I did however go out and buy a new printer (the 5741) so I could get 18 months free (it came with a year and then used the 6 month code). I figured it would be worth it and I could always lower my original plan to a less expensive one. Could you use referrals codes in addition to promote code and one that came with printer? I am not sure. If the printer comes with the HP ink I think it assumes that that is where you got the idea from rather than a referral code. You can use a referral and promo together, or a promo with an ink startup that comes with it. You can always try contacting customer support and letting them know that someone gave you the idea to get the printer or join and see if they will add the referral code for you. Good luck. Thank you, can you please provide me details on system issues you foresee while you install a printer, any external software to be downloaded? Hello! When you purchase an HP printer it will come with directions on how to install the software (wither with a CD or digital download). I have used both Mac and PC computers and have not had trouble. You do need to have wireless internet so HP can monitor. If you have trouble setting anything up you can talk to HP Customer Support and they will walk you through it. How do you like your officejet 5741 printer? I just bought it since it comes with one free year of ink but just curious as to how you like the printer! Hello! I have had my 8620 longer so that is the one I use for printing double sided card stock and bulk printing. I bought the 5741 for my classroom since it came with the year of ink and I just couldn't pass up the deal. So far I have been happy with the color quality and overall speed. I have not tried to print a ton from it at a time yet but it seems to meet classroom needs :) I hope you love it. The instant ink program is SO worth it! Does HP charge retroactively charge for each free month of service we initially receive when we cancel the subscription? I heard many people say that. Honestly I am not sure. Once I started years ago I have never been tempted to cancel so I didn’t ask. You could contact their customer service and ask them, they are usually very helpful. Thanks for the useful information. Your post is very informative and beneficial for us and those who used HP printer and need support, Contact HP Printer Technical Support and get support in minimum time by our experts.